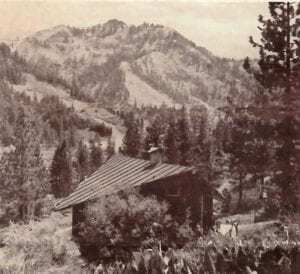 Designed and built in the pre-Olympic solitude of 1950s Squaw Valley, the Klaussen Cabin was a simple affair that sat quietly on the south-facing hillside overlooking the valley. The 24-foot square box topped with folded roof planes and finished with walls of glass and redwood siding made for some cozy alpine living. 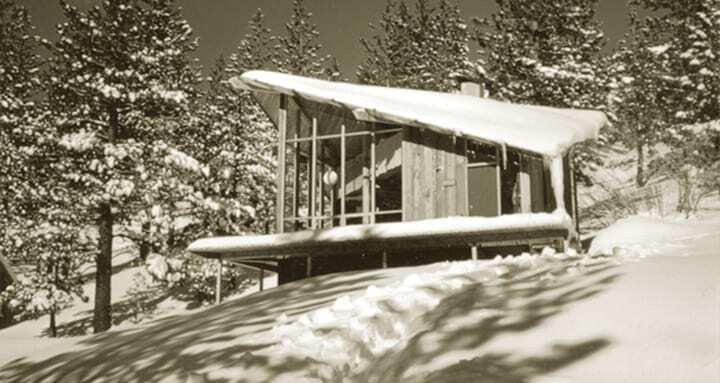 Designed by legendary San Francisco architect Henrik Bull, the simple little cabin (emphasis on cabin, all 850 square feet of it) was born from a love of skiing and the accompanying natural surroundings. 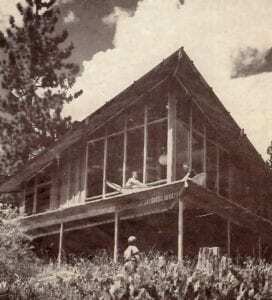 The cabin so captured the essence and magic of the alpine skiing scene at the time, it was featured on the 1958 May cover of Sunset Magazine as the “Sunset Discovery House,” launching Bull’s decades-long career in noteworthy snow country design. Sixty-plus years later, the original little cube was in rough shape. Project engineer Eric Bacon described the cabin as “seriously compromised” on several fronts due to numerous ill-conceived additions to the building and the continuous flowing of a year-round spring beneath the house. Combined with decades of long, abusive Sierra winters, the cabin found itself a far cry from its original mid-century glory. “There was water infiltration everywhere, the footings were being undermined in places—it was a complete mess,” says Reno-based residential designer Silkin Corson. Corson was originally called in to aid with a remodel of the dilapidated house, but after considering a range of unsatisfactory options, he trepidatiously suggested a teardown instead. 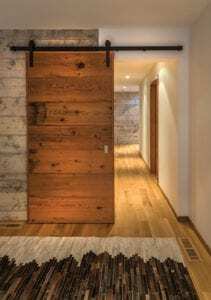 Purchasing the home in 2012, the owners—a family of four based in Montara, California—loved the simplicity of Bull’s original design and how it spoke to the heritage and history of alpine skiing. Tearing the house down seemed inconceivable, but eventually, the notion of essentially rebuilding the exact house, or at least the twenty-first century version of it, became a palatable consideration. The owners have faithfully spent most every weekend of the past several winters schussing down the peaks of Squaw Valley. Appreciative of Squaw’s place in history as the host of the 1960 Winter Olympics and with their two young daughters about to join the Squaw Valley Ski Team this coming winter, they place a high value on the close proximity of the house to the ski hill. Completed in 2016, the twenty-first century version of Bull’s simple cube on the hillside was born anew. 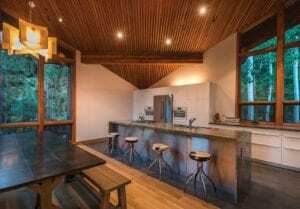 To better accommodate the owners’ needs and updated living styles, however, the new design multiplied into three connected but distinct “pods” totaling 3,490 square feet. The entry pod is occupied by partially subterranean garages with guest living spaces above, the second pod contains children’s bedrooms below and living room above, and the third pod has the kitchen/dining above the master bedroom suite. True to the essence of the original cabin, the updated version does not have a striking wow-factor presence as it nestles into the hillside. But this subtle stance faithfully follows the Henrik Bull principle of remaining “of” the landscape and not making a big fuss of itself. “These boxes are literally down to the inch of what Henrik designed,” says general contractor Dan Fraiman. Fraiman connected with the owners through their real estate agent, Dave Westall with Oliver Luxury Real Estate, and freely uses phrases like “best experience” and “most awesome” when referencing both the project and the owners. The exact dimensional match to mid-1950s construction standards results in a smaller scale throughout the home. Compared with contemporary residential construction, hallways are a touch narrower, ceiling plates lower and replicated five-panel interior doors thinner. But this measurable step back into the twentieth century delivers an interior that is cozier and more comfortable with an instantly livable feel. “The general aesthetic of the original house was exquisitely preserved,” says Corson. Sitting atop a brand-new base of board-formed concrete, the home’s outward identity is comprised of vertical cedar siding, Sierra Pacific windows and exposed glulam beams. The main entry is quietly situated between two single-car garage doors, allowing for a hasty retreat from blizzard conditions into a sheltered, cavernous passage. Interior materials are elegant and simple, creating a soothing, cohesive environment throughout: Italian ink-jet-glazed porcelain tile and 5-inch unfinished Appalachian oak planks finish the floors; bright, smooth white walls are stacked on textured board-formed concrete foundation walls; and bathroom and kitchen surfaces offer planes of silky white marble. An open staircase of thick fir treads is seemingly suspended from vertical steel cables, making for an unfussy procession between floors. The entire fireplace and kitchen island seating area are finished with 3/16-inch-thick steel panels and, quite notably, interior accent walls and a handful of sliding barn doors celebrate the home’s original redwood siding, carefully salvaged, wire brushed and repurposed. All views toward the valley below and across to various famed ski runs are framed through floor-to-ceiling glass at the peaked corners of each pod. The mature grove of aspen trees swaying along the edges of the home settle the upper-level living spaces fully into place with softly filtered sunlight pouring in to fill the 24-by-24-foot footprint with a hazy warm glow. 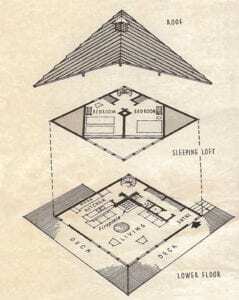 The sloped ceilings of all three pods were painstakingly detailed to perfectly mimic the appearance of the original roof structure, and Fraiman points to this as his favorite bit of detailing in the house. Without the texture that this detailing adds to the simple spaces, the character of the house would be vastly different and considerably more Spartan. Fraiman and Corson are both confident that the cost and efforts were worth it. “The recreated ceilings are an important part of maintaining the original integrity,” says Fraiman. “Henrik had an innate talent for architecture—interior and exterior spaces are juxtaposed as one through clean lines, proportion and simplicity,” the owner says. Vangela Wightman lives in Truckee and has long harbored serious affection for Henrik Bull’s greatest creation: the A-frame. 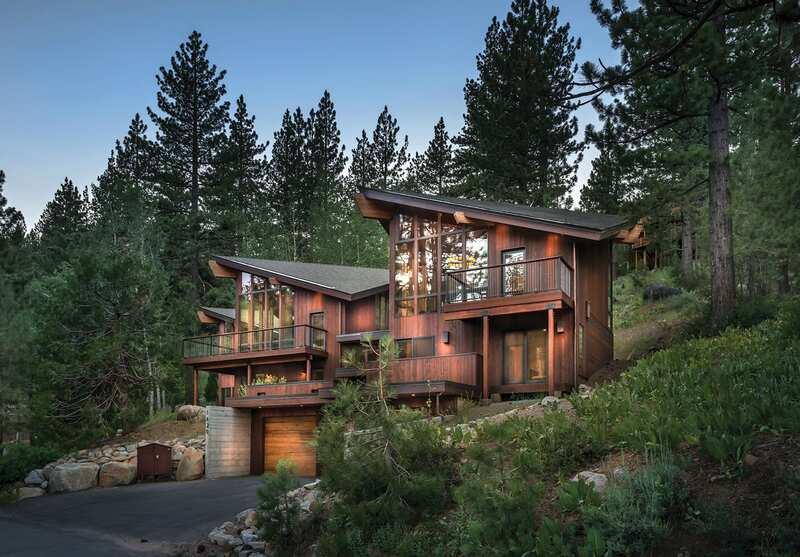 Thank you Vangela Wrightman for spotlighting this very special home in the Tahoe Quarterly and to all of those who worked on this project. Henrik Bull was my father. 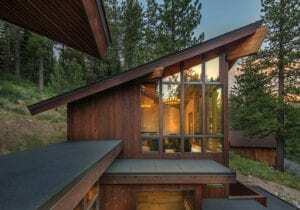 His idea of architecture and nature working together was a real passion for him and many of his early works in the Squaw Valley and Tahoe area spotlighted this direction he would take for the duration of his career. I am so appreciative of all the kind memories and respect you have all held him and his work to. He was truly a special man who is dearly missed.